"Four and a half stars! Wow...Damn near a perfect movie"
- Synopsis . . .
- General Credits . . .
- About The Cast . . .
- About The Filmmakers . . .
- Bios . . .
- Request Movie Info . . .
- The Real Life of a Diamond man . . .
- Diamond Men Still Shots . . .
Out Soon On Video and DVD! About the Filmmakers . 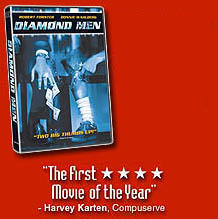 . .
Diamond Men is Dan Cohen’s debut as a Director. The script evolved from his family’s three generations in the diamond business and an intimate knowledge of small town Pennsylvania. Dan previously wrote, produced and played a lead role in The Whole Truth. Janet Maslin, writing in the New York Times called the shoestring indie effort “a hardworking comedy with a homemade flavor” and likened it to the early work of Woody Allen and Albert Brooks. The NY Post called it “funny and truthful,” and awarded it three (out of four) stars. A festival favorite, it was awarded prizes in Fort Lauderdale and Orlando. Mr. Cohen recently directed Bruce Smirnoff’s one man show, “Other Than My Health, I Have Nothing!” -- an LA Weekly “pick of the week” that ran for over a year and a half and took the Valley Theater Award for Mr. Smirnoff’s performance. Mr. Cohen divides his time between Los Angeles and Lancaster Pennsylvania, where he has worked as a journalist and television reporter. Before coming to film, Dan worked part time in the family business while at the same time pursuing his interests in journalism and film. After his father died in the mid-eighties, he ran the family business for a while. But the call of writing and directing eventually led to the creation of The Whole Truth, and Diamond Men. Robert Field is a Investor Builder from Pennsylvania. His first venture into film was as Executive Producer for the award winning feature Liquid Sky, which was released in 1982, and went on to become a cult classic. Active in both local and national affairs, he co-founded and supports “Project Forward Leap,” a philanthropic organization offering inner city youngsters a five week summer academic camp at college campuses, and co-founded and serves as co-chair of “Common Sense for Drug Policy”, a foundation involved in the reform of our nation’s laws regarding controlled substances. John Huneck has shot more than 30 million feet of film for television and movies. He was Director of Photography on over a dozen full-length features, including The Hit List with Jeff Fahey and Yancy Butler, and No Retreat, No Surrender, a highly successful theatrical film. He served as DP on five ABC After School Specials, and lensed over a hundred episodes of various TV series. John has also directed episodes of “Superboy” and “Lands End.” He has shot film on land and sea, in stifling heat and freezing cold. He frequently helms second units, and shoots special effects for Hollywood blockbusters. Rick Derby’s feature documentary, Rocks With Wings, will make its festival debut later this year, and then air over the PBS network in prime time during 2002. Produced over thirteen years, it follows a Navajo girls’ basketball team and its devoted coach from its shaky beginnings to a championship. Awarded over $1,250,000 in funds, including a Ford Foundation grant, it required Rick’s single-minded dedication in order to see it to completion. Rick has also served as post-production coordinator for Alfonso Cuarón on Great Expectations. He was veteran editor Cynthia Scheider’s assistant editor on numerous features for Twentieth Century Fox and Tri-Star pictures. His television work includes several seasons as an editor on NBC’s Dateline. Mr. Derby was involved with Diamond Man from the first drafts of the script through the final stages of post-production.